Life is a funny thing. Sometimes you start something (like urban farming), then add something else (like having kids) and then add something else (like a blog) and then add one last thing (like a string of colds and flu bugs that culminated in both Organiguy and I getting pneumonia within one week of each other) and something has to give. Or someTHINGS. Those things were gardening and this blog. Organiguy and the kids I kept. So basically the past two years have been a blur, with adding a third child to our brood and then getting sick over and over (probably from the stress of MANY CHILDREN, who are worth it), but now here I am blogging again because Organikid #3 is almost two and things don't seem quite so crazy. I'm going to transition this post to garden talk by mentioning that as kids get older and can do more stuff, they start to develop the ability to actually be helpful. Sometimes that means fetching a diaper or picking up a toy mess. Today the manifestation of that helpfulness was that Organikid #1 and Organikid #2 helped me prep the carrot bed. By help, I mean that they dug around in the box a little with adorable kid sized garden tools, broke up clumps of dirt, removed a few rocks, and didn't hurt anyone. It's a start. For the record, Organikid #3 helped by staying out of the way and playing without acquiring any injuries. I like to use seemingly mundane activities to help teach my kids about things like growing vegetables, so today we talked shop as we loosened soil and ooh-ed and ah-ed over the cute little worms we kept finding (an indication of happy soil, by the way). Organikid #3 joined us for the ooh-ing and ah-ing. He LOVES small living things and probably has a future in entomology (a.k.a. "bug science"). We started by discussing why we use a garden fork to break up the soil rather than turning over the soil (we no longer waste time and energy double digging as it disturbs the soil structure and living soil dwellers, such as nematodes and worms, more than is necessary). We drive the garden fork straight down into the soil as far as possible and then rock it back and forth, or even twist it, breaking up large clumps with our hands as we find them. Detour! I'm a huge fan of the Radius Garden Pro Ergonomic Digging Fork. It's what we use and I love it so much that while the rest of my tall tools are generally leaning unglamorously against a wall or tucked away in a corner of the patio, my digging fork is locked away in a storage cabinet. No affiliate links or anything else here either - I just really like my digging fork. Now back to the carrots. Next, we talked more about the friendly worms and why they're beneficial to our garden (worms break down organic matter in the soil, and their casings, poop, are loaded with nutrients which are helpful to our growing plants). Finally, as we smoothed the surface of our planting bed, we talked about how level soil allows water to be distributed more evenly and ensures that all of our plants will get an equal share of moisture. When the soil in a bed is uneven, the water will naturally tend to pool in the lowest areas, leaving the hills high and dry. I'm always amazed with how easy it is to tell that I didn't do a good job leveling a bed as I watch the seeds start to sprout in clumps in the lowest areas of an uneven bed. As a result, each year I try a little harder to get the beds more level and keep my drip hoses clean and in proper working order. Shortly after this point the kids were ready for a play break, so I finished leveling the bed with a rake while they created some happy-swinging-sliding-digging-in-the-sand background noise. Later today, we'll be planting carrot seeds in neat little rows along drip lines. I plan to plant them about 1/8" deep - just covered enough to keep them moist and hidden from garden pests like ants (which are plentiful this time of year in my garden). I should mention that it's absolutely NOT necessary to plant carrots in rows. I choose to plant them in rows because it's my preference. 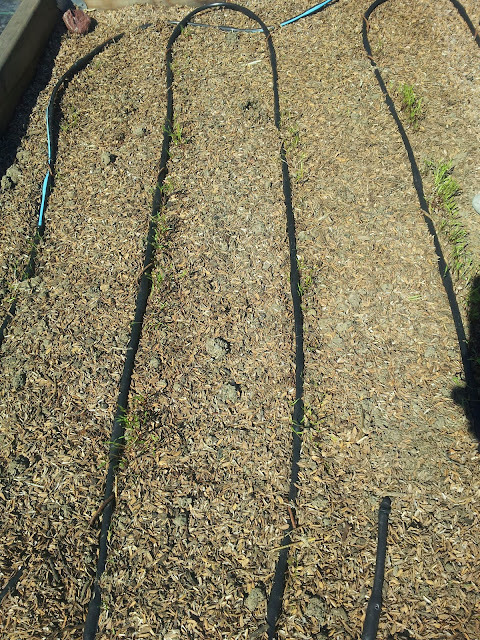 I like to plant my carrots (and most everything) along drip lines so that they get an appropriate amount of water without much effort on my part. A note about succession planting: Carrots are a perfect candidate to plant a row or two at a time so that you'll have carrots for a longer period of time. Planting them 2-4 weeks apart should be appropriate. After we sow our carrot seeds, we'll cover the rows with burlap to keep the seeds from drying out. The burlap shades the soil and keeps it moist in between drip sessions. Using burlap is a handy trick I learned from the Master Gardeners. I was certain it wouldn't work, but I was proven wrong the very first time I tried it as the seeds germinated so well that I went from thinking carrots a difficult vegetable to grow to considering them among the easiest. Unlike some other seeds, carrot seeds don't require light in order to germinate, but they won't germinate if they dry out. Burlap solves the issue easily. I'm sure there are other materials that could be used for the same purpose, but I haven't yet taken the time to explore that option. The carrots will be watered twice daily (10 minutes per drip session). Once the majority of the seeds have germinated, the burlap will be removed. After another couple of weeks or so, the drip sessions will be reduced to once daily. Even watering is important when growing vegetables, so drip irrigation is a major contributor to my success - and occasionally my failure when it malfunctions and I'm not paying attention enough to notice. When the carrots are well established, and before the roots start to really fatten up, thinning the plants is an option. I rarely thin my carrot plants because, well, it's labor intensive. If you want your carrots to grow more happily, straighter, and perhaps a little fatter, consider thinning them to about two inches apart. To thin them, simply snip the tops off of unwanted plants at the soil line. The roots of thinned plants will rot and make room for the rest of your carrots to grow unimpeded. This year we'll be growing two varieties of carrots. The first is called "Parisienne" and they are hands down our favorite variety. They are round, rather than the traditional carrot shape, and they're wonderfully sweet and flavorful. Because of their shape, they typically don't have the standard issues with forking that you might see with a long, skinny carrot. They also work well in containers, so if you thought you couldn't grow carrots because you didn't have enough space, think again! The other variety of carrot we'll be growing this year is a variety new to me called "Chantenay Red Core". Baker Creek Heirloom seeds (where I purchase all of my seeds) calls it, "a large, stump-rooted carrot with a deep red-orange center; great for juicing or fresh eating." From the picture on the package, it appears to be something in between a round and a standard shaped carrot (on the long side, but considerably fatter than a standard carrot), so I'm curious to see how they turn out in my garden. I like to try new varieties of vegetables from time to time and compare them to our favorites, so we'll see how these stack up. When the tops of our carrots begin to reach about 1" wide, we'll start pulling up the occasional tester carrot. I love small, fresh carrots because of their sweetness, though if they're too young they won't taste good and won't be crunchy. If they're too old, they'll be woody and generally unpleasant - another reason to plant a row or two of carrots every couple weeks during the planting season. You can dig down to the carrot top if yours happen to be below the soil line and thus difficult to see. I'm already thinking about delicious soups and stews made with fresh carrots, and kale and carrots sauteed together with a little vinegar! Happy growing. Depth to Plant Seeds: Surface sow or cover very lightly (I plant about 1/8" deep). Seed Spacing: 2", or scatter sow and thin to 2" when seedlings are a few inches high. Watering: Water very regularly while seeds are germinating. Carrot seeds must be kept moist in order to germinate. 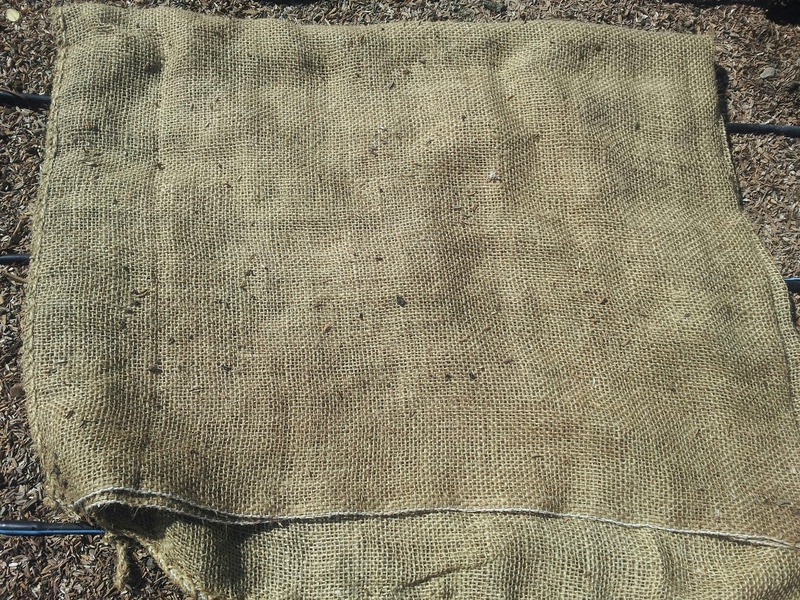 Some gardeners cover their newly planted carrot beds with burlap to retain moisture, removing the burlap as soon as the seeds germinate (at which point they'll need light). After germination, water regularly. Special Considerations: Growing in well dug soil will help prevent carrots from growing strange shaped roots. If growing in containers, try a variety called Parisienne, which grows small round roots rather than long skinny roots. Parisienne carrots are available from Baker Creek Heirloom Seeds (rareseeds.com). "I should read more books!" (but then you get a subscription to Netflix and forget what a "book" looks like for several weeks while you binge watch every episode of MacGuyver ever made). I had one of those "I should do this!" ideas that sounded great and made sense and was fun to talk about. It involved chickens. I always imagined that someday we'd get some chickens and my little backyard urban farm would become more than fruits and veggies (and herbs, and flowers and whatnot). But, Organiguy and I both kept dragging. our. feet. when it came to the chickens. Why? Because unlike plants, which don't make sounds (at least, not ones that I can hear), and don't have eyes (except potatoes - I don't trust potatoes for that reason), chickens are living, breathing creatures. Creatures that will haunt you for the rest of your days if you neglect them and they die. Is there such a thing as a chicken ghost? If so, I'm worried about them. A funny thing happened though. Some friends were moving away and selling their fancy-schmancy-just-the right-size-for-my-yard chicken tractor, which, by the way, is not a tiny tractor for chickens to drive. If they made such a thing, I would have had chickens long ago, because a driving chicken can take himself to the vet for Pete's sake and the chicken ghost issue would be nullified. A chicken tractor is a movable chicken coop, which is great for urban farming because you can move it around your yard or between your raised beds and the chicken poop goes straight to the ground and becomes fertilizer without any effort on your part whatsoever. Intriguing, no? So Organiguy and I talked it over (the chicken tractor thing - not the tiny driving chicken thing) and it went something like this. Me: So and so is selling her chicken tractor. It's really nice. We probably aren't ready for chickens though right? We shouldn't do this right? Yeah, nevermind. Organiguy: What's a chicken tractor? Oh that sounds cool. Whatever you think is best, dear. Me: Okay, so what should we have for dinner tonight? Maybe chicken? Notice how I'm getting distracted because food. One of the reasons I grow my own food is because I like food. I like it being near to me. I like being able to eat food whenever I feel like it without having to make a trip to the grocery store. I also like that the food I grow ends up making me healthier rather than taking a permanent vacation on my thighs. But I digress. Me: Well, we really need to make a decision about the chicken tractor. We need to let so and so know if we want it or not. She wants such and such amount of money for it. What do you think? Organiguy: Sounds great! Such and such is a great price. Can I make dinner tonight and rub your feet while I read the kids their bedtime stories and help a group of foreign dignitaries create a plan for world peace? Me: I guess that settles it! Have I mentioned that Organiguy is also a superhero? If that isn't evident from the conversation I just shared, then go back and read again. Moving on. So we went ahead and bought the chicken tractor and now it's sitting on one of my raised beds waiting for chickens. I'm thinking of starting an "Occupy Chicken Tractors!" movement to see if any chickens will find their own way to us and stay until we agree to their demands (which will be never, because I don't negotiate with chickens - and that has nothing to do with my political views). If that doesn't work, I'll be buying some chickens in the spring, when I'm good and ready for them. Now that we've gotten all the other business out of the way, let's talk chickens for a minute. I grew up out in the country and we had all sorts of farm critters. Pigs, horses, ducks, turkeys, rabbits, and yes, chickens. There's something about going out to the barn and gathering eggs that makes you feel all hunter-gatherer. I do have to admit, however, that I also feel a little like a thief. The poor hens lay those giant eggs (it's like childbirth four times a week!) and I go out there and steal them whenever I want an omelette. It seems wrong, right? Anyway, I steal the hens' babies and eat them. With salt and pepper. Or with mushrooms and zucchini in a fritatta. There I go talking about food again... But chickens ARE food, so it's okay. Clearly, you can expect to see future posts about our chicken adventures. In the spring, the Organikids will be getting some wasted fritatta ingredients chicks to raise - with much supervision by us, of course, and in due time there will be eggs aplenty. In the mean time, now that school is in session again (fill in this space with your favorite obligatory "the parents party when the kids go back to school" joke - I won't tell), I'll be adding some new "how to grow ______" posts to the vegetable growing guide. And spending an ungodly amount of time daydreaming about fresh eggs of many colors. And chicken ghosts. When it comes to gardening, I've found that there's often an easy way to do something and a hard way. The easy way usually costs more up front but saves money and effort in the long term. The hard way is usually cheaper at the beginning, but more time consuming. Novice gardeners often choose to do things the hard way in an effort to save a few dollars, but they don't realize that doing so might just cause them enough frustration to bite someone, or to give up on gardening entirely (which is far worse than biting, but please don’t do either) when they start getting into the thick of things. This can happen with things like irrigation, weeding, and the subject of today's post - seed starting. 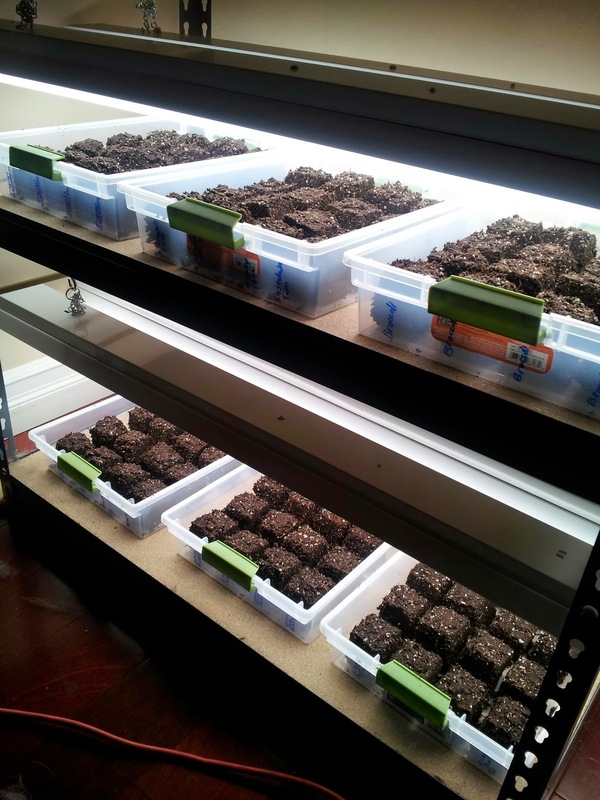 There are many different ways to start seeds indoors. In the past, I’ve generally planted seeds in small pots. There are plenty of creative containers you can use to start seeds, but containers made out of things like paper and cardboard can contain chemicals that you might not want near your vegetables. The amount present is likely to be small - but why take a chance? Terracotta pots seem like a wise option because they can be reused. However, I encountered a problem. First, any pot that you reuse from year to year, especially one used for seed starting, should be sterilized. Seedlings grown in previously used pots that haven’t been properly sterilized can die from soil borne diseases. Pots are usually sterilized by either washing them in bleach water or baking them in the oven (don’t bake plastic pots, of course). I’m not a fan of bleach in general, especially around food, and baking pots seemed like a stinky (cooked soil can be smelly) and somewhat labor intensive job, so I didn’t particularly want to have to use either sterilizing method year after year. Terracotta pots turned out to not be such a great option after all. Next I tried peat pots (mine were actually a coconut fiber rather than true peat). Peat pots seemed like a better option than the terracotta pots since I wouldn’t be reusing them and therefore wouldn’t have anything to sterilize. However, I now had something I needed to buy each spring, and that just isn’t my style. And if you’re thinking that peat pots are convenient because you can just stick the entire pot in the ground and allow it to decompose, think again. The pots won’t decompose in time to let your plant’s roots grow through, so put that idea out of your head. Peat pots are a no go in my opinion. Fortunately for “keep-it-simple” gardeners everywhere, there’s another option called “soil blocking”. Soil blocking is the process by which soil is compressed into cubes (“blocks”) with an indentation at the top into which a seed can be dropped. Because the soil in the blocks holds together on it’s own, there’s no need for any container whatsoever. The blocks are placed on trays while the seeds planted in them are germinating and they’re watered either via frequent misting or by putting water into the bottom of the tray as needed to keep the blocks moist. 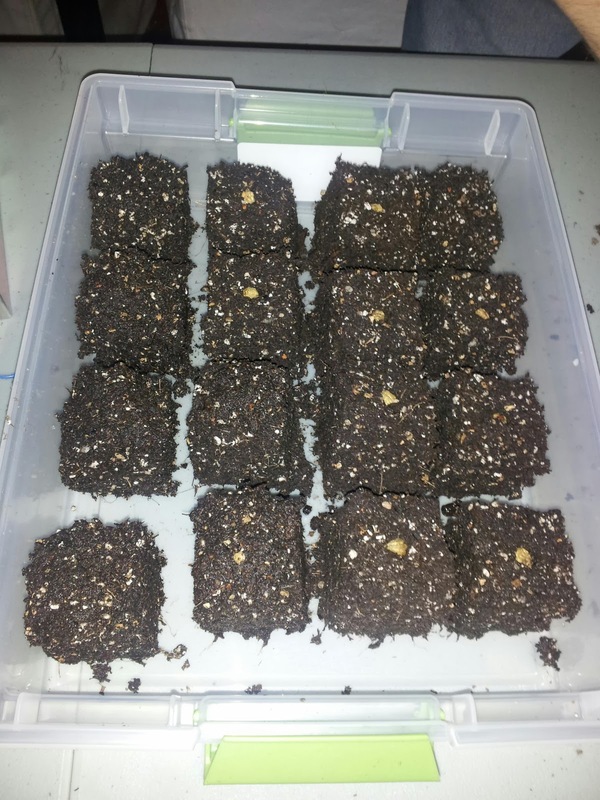 In addition to not having the burden of buying or sterilizing pots at the start of each growing season, soil blocks are also quick and easy to make, and if you’re making the standard 2” size soil blocks using a standard soil blocking tool, then you’ll be making four soil blocks at a time. A soil blocker this size makes big soil blocks with a 2” block-sized indentation in the top, so when you’re ready to give your plants more room to grow, all you have to do is make a big soil block and drop your 2” soil block into the indentation at the top of the large soil block. Easy! You can, of course, make your own soil blocking mix, but I decided against it for now since I wouldn’t be making enough soil blocks to justify buying bags of all of the ingredients needed for soil blocking mix at this stage in my urban farming superhero career. Also, I needed the extra money to buy a new cape as my last one got stuck in the rototiller. I’ve since learned that rototilling is rarely necessary in the garden, and that one shouldn’t wear a cape while rototilling, but we’ll need another post to discuss that. I repeated that last step three or four times (this is called "charging" the soil blocker) until a little bit of water started to come out of the top of the blocking tool. 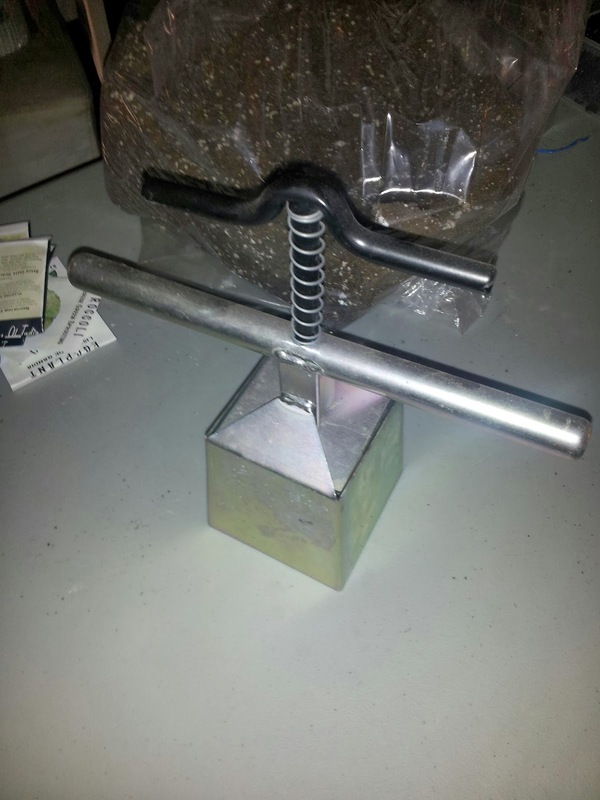 Finally, I squeezed the blocks out of the tool onto my tray while lifting the tool upward, and voila - soil blocks! 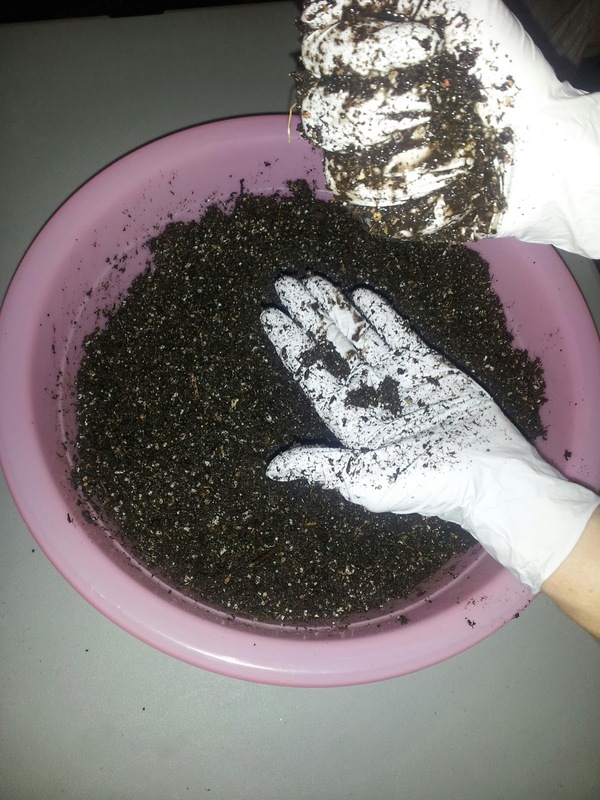 I then covered the seeds with the appropriate amount of soil. That’s it! It’s so easy that I made ninety-six soil blocks in about an hour. It took me a little while to seed all of the blocks because I was planting quite a few different seeds and wanted to make sure I labeled the blocks correctly. You can put plastic wrap over the top of the blocks to help them to retain their moisture (or a lid if you're putting your soil blocks in plastic boxes, like I did). Be sure to not let the plastic wrap actually touch the top of the soil blocks. Once seedlings emerge, the plastic should be removed to allow greater air circulation and prevent fungal issues. To water the soil blocks, I’m using a spray bottle. I’m spraying my blocks several times a day to help them stay moist. If you compress your blocks tightly enough, you can also water them from the bottom by simply pouring water into your tray. I’m not sure I’ve made my blocks tight enough, so I’m opting to stick with the spray bottle for now. Spraying them so attentively makes me feel a little bit like a crazy plant lady, but I can live with that. Some day I’ll set up built in misting nozzles on a timer so that I don’t have to spray my blocks all day long - though that might actually get me closer to crazy plant lady status than simply spraying my plants by hand. Hand spraying also makes me feel more important, like a brain surgeon - if I don’t spray the plants, they’ll flatline! So hopefully now you’re having your own grand visions of row upon row of soil blocks covering all of the flat surfaces in your home, adorning every windowsill, and alighting on every bathtub edge. Once you start making soil blocks, it's hard to stop. You're limited only by the amount of soil blocking material you have - and the amount of space you have to store soil blocks! So now I pass my soil blocking addiction onto you. Ready, set, go! Among the most important staple vegetables of my garden, lettuce is certainly a favorite. It isn’t as glamorous as say, chard or corn, but lettuce becomes a canvas for all of the other veggies in my garden when a salad is on the dinner menu. Besides, chard and corn are both needy - like a best friend who always seems to have a problem and never cares a bit about yours! And don’t be fooled into thinking that all lettuce is drab and flavorless. There are an abundance of varieties of lettuce waiting to be grown in your garden with names like Tom Thumb, Flame, and Little Gem that look and taste nothing like boring old Iceberg - which tastes exactly like what I imagine an iceberg tastes like - water. Exciting! Wait... nope! If you haven’t yet tried to grow lettuce in your garden, you may be pleasantly surprised not only by the flavors and textures of home grown lettuce, but also by how seriously easy it is. At the very least, it’s worth it just so you can throw a dinner party and make your guests uncomfortable by proudly announcing that you put your own blood and sweat into the growing of the lettuce they’re eating. They’ll probably be a little put off, but hey - that’s just more delicious homegrown lettuce for you! This year my lettuce seems to have become a favorite of various garden pests (including wasps, which has me baffled), but there has always been plenty of it- I never seem to run out of lettuce because it keeps growing and growing until it bolts - and then it’s time to plant more anyway! Unless you live in a climate with cold winters - in which case a heated greenhouse might give you the year round lettuce you’ve always dreamed of (or am I the only one who dreams about year round lettuce?). If you examine lettuce seed packets and compare them to gardening books, you may find that they don’t always agree on how deep to plant the lettuce seeds. 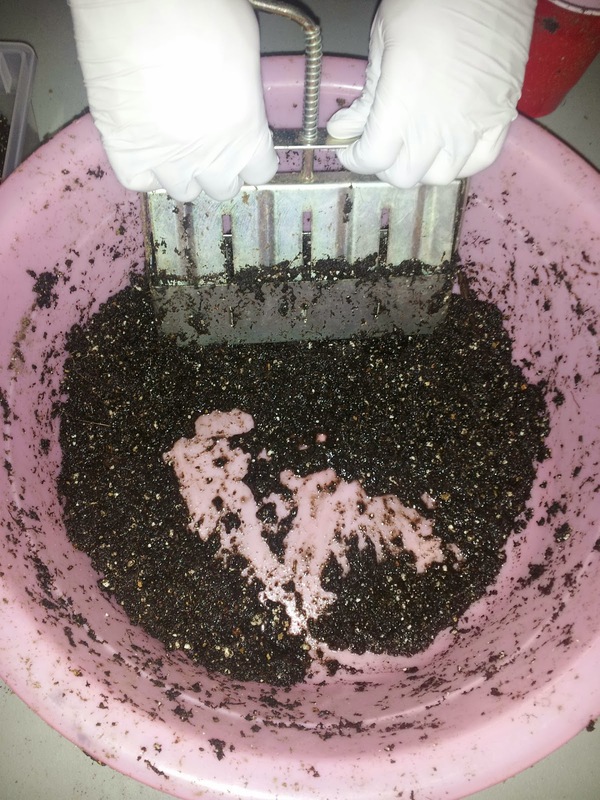 Some sources say to surface sow the seeds and barely cover and other sources say to plant them at a depth of ¼”- 1/2”. Having tried planting lettuce using both methods I can safely say that surface sowing was a total bust! Plan to plant lettuce seeds at a depth of ¼”-1/2”. Before you plant your seeds, you may want to install drip irrigation. Rows of lettuce should be planted about 8”-10” apart, depending on the variety, so install your drip irrigation lines 8”-10” apart and then plant along the irrigation lines. Using your finger or a garden trowel, create a small trench in the soil about ½” deep. Place your seeds all along the trench and then cover with soil. Head lettuces should be seeded more sparingly while cut and come again lettuces can be sown heavily if you plan to harvest them a few leaves at a time rather than taking the entire plant at once. If growing a cut and come again lettuce such as Lollo Rossa (a favorite of mine offered through Baker Creek Heirloom Seeds), you can plant very close together. You can forgo the rows altogether, in fact, and just seed your entire raised bed! Lettuce can also be planted in containers and because of its shallow root system, lettuce doesn’t need a very deep pot to grow in. Cut and come again varieties are ideal for growing in containers because you can fill the entire container with lettuce rather than wasting space in between lettuce heads. Lettuce seedlings snuggled right up next to their drip lines. Lettuce likes consistent water. My lettuce is watered with drip irrigation for about 30 minutes each morning and it does well. 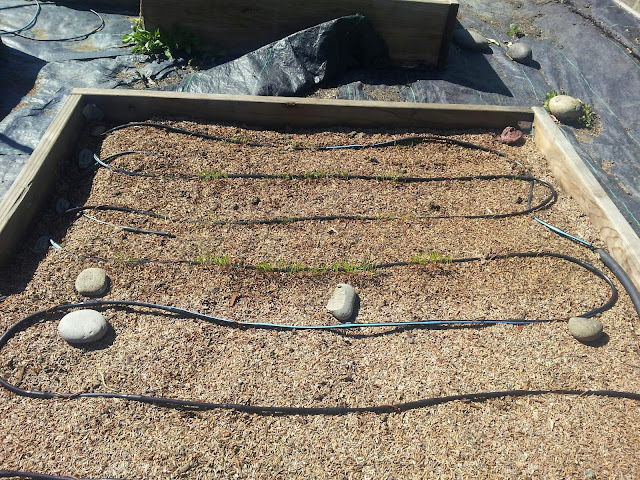 You might want to hand water lettuce for a few days after planting the seeds, but once the sprouts appear you can leave it to the drip irrigation, which should suffice. When hand watering, use a misting or otherwise very gentle spray to avoid blowing the seeds to kingdom come, and do so until the soil is wet about 1” down (which you can check by sticking your finger in the soil away from your rows). Note that lettuce likes consistent and regular watering and will bolt (go to seed) if it isn’t watered regularly (or if the outside temperature is hot for too long). Shading lettuce plants can prevent early bolting if the outside temperatures are high. When lettuce seedlings have grown to a couple of inches tall, thin head lettuces to about 6-8” apart (depending on the variety) to allow adequate room for the heads. Cut and come again lettuces probably won’t need thinning. 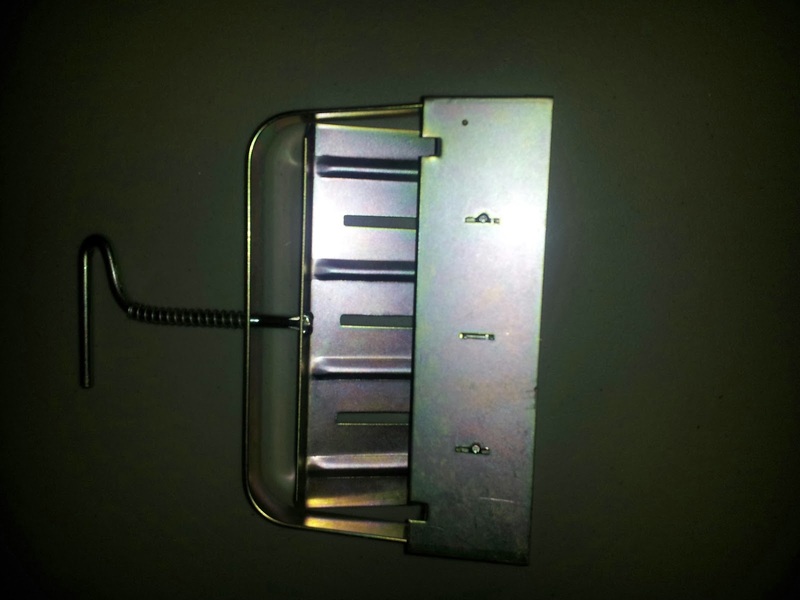 You can use the thinnings for an early salad or just munch as you go (although rinsing any produce - even produce from your garden - is always the best practice). For cut and come again lettuces, simply take what you want, leaving about 1” at the bottom of the plant so the lettuce can regrow. For head lettuces, cut the entire head at ground level. Some head lettuces can also be cut a couple inches from the ground and will regrow, and still others will continue growing happily even if you take a few outer leaves. Be sure to learn about the varieties of lettuce you’re planting so that you know the best way to harvest it. Lollo Rossa and Tom Thum Lettuce. Two excellent varieties to start with are listed below. They are both available from Baker Creek Heirloom Seeds. For more information about the differences between heirloom and hybrid seeds, check out Episode 4: Wherein Organigirl Teaches You About the Differences Between Hybrid, Non-Hybrid, Heirloom, and Genetically Modified Seeds. Tom Thumb: Tom thumb lettuce is a head lettuce that produces beautiful bright green heads about 8” in diameter. The taste and texture is excellent and the heads are the perfect size for two large portions of salad or four small portions. 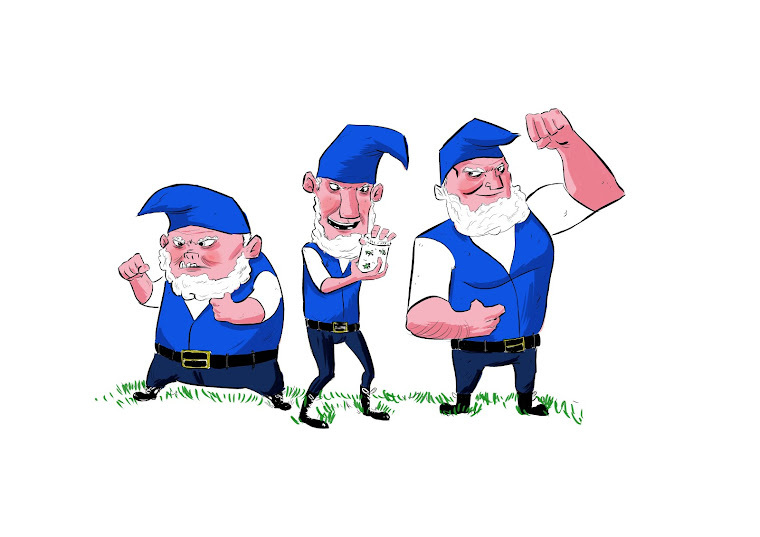 I grow Tom Thumb every year. Harvest this variety by cutting the head at ground level. Lollo Rossa: Lollo Rossa is a cut and come again leaf-type variety with beautiful red tips. Lollo Rossa doesn’t need to be grown in rows and is a great choice for containers. Or, try alternating rows of Tom Thumb and Lollo Rossa for a pretty pattern in your lettuce garden. Lollo Rossa can be harvested by the leaves. Cut an inch or two from the base and it’ll keep growing. My head lettuces are beginning to bolt already, but the Lollo Rossa is still going strong! We love the flavor and the delicate texture of this lettuce. It also makes a nice salad on it’s own or in combination with Tom Thumb lettuce. Depth to Plant Seeds: 1/4"-1/2"
Seed Spacing: Most varieties 8-10"; Romaine 10", leaf lettuce 1/2" apart (very close!) or 8" if allowing to grow to full sized heads. Row Spacing: See "seed spacing" above. Special Considerations: Lettuce likes some shade when the weather turns hot. Shading lettuce during the hotter time of the year can keep it from bolting (going to seed) as quickly as it would otherwise. For more basic planting information on different garden vegetables, check out my Vegetable Growing Guide. Do you like squash? (Please don't say no, please don't say no!) I do. In fact, so great is my love for squash that I currently have somewhere around forty squash plants taking over my garden. I planted twenty-one varieties of squash in my raised beds this year. Of those twenty-one, nineteen varieties are growing. And taking over. They have a mind of their own, and it's no joke. One particularly prolific variety called "Jumbo Pink Banana" found a low branch of my lemon tree and has started to climb up, up, up! Soon I'll be picking squash AND lemons off of the tree. Did I mention that the squash is taking over? I have no regrets. If you're a lover of squash, as I am, and you have a space in your garden that needs a little action, it might be time to start learning about all of the many, many, many varieties of squash that exist so you can pick a few (or twenty-one) to plant in your garden next year. I typically purchase my seeds from Baker Creek Heirloom Seeds, and let me tell you - they sell more than a few varieties of squash seeds. Squash is an easy vegetable to grow if you get it off to a good start. It needs plenty of nutrients, but I've had great success growing it in raised beds with a mix of 1/3 organic compost and 2/3 planting mix (the standard ready-to-go dirt that you can get from your local garden supply). For established raised beds, just add a couple inches of compost before you plant and mix it in well with a garden fork. If you don't have a garden fork, a shovel will work fine. For each variety of squash you plan to grow, build a small mound of dirt in your raised bed about 6 inches high and 18"-24" across. Mounds should be a few feet apart to give your squash plants room to grow. I’ve had great success with four mounds in a 4’x8’ bed. If you’re growing winter squash you may want to give your plants a little extra room or use trellises. Make sure to incorporate a generous shovelful of compost into each mound. Form a little "crater" about 6 inches in diameter at the top of the mound (it'll look somewhat like a volcano) and place five seeds in a circle around the inside edge of your "crater". 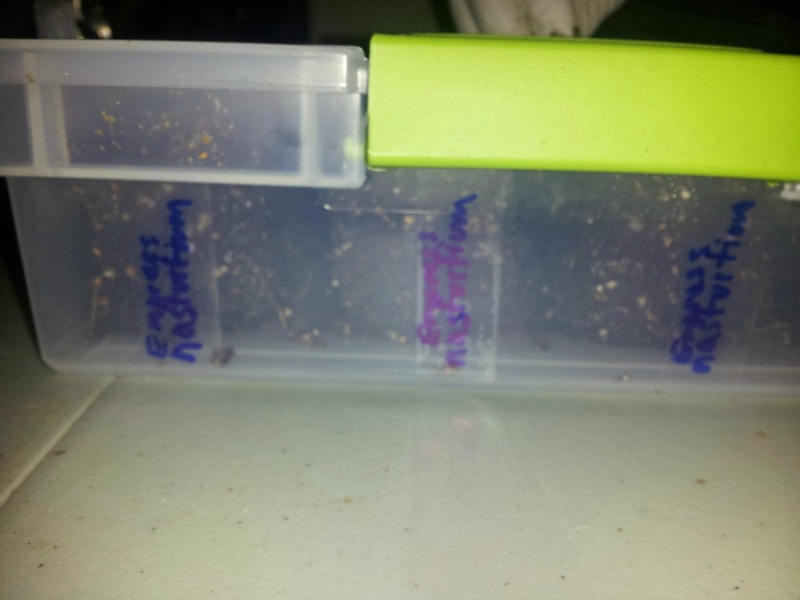 Then cover your seeds with ½”-1” of soil. I also like to dig a shallow trench around the perimeter at the base of each mound to encourage water to stay near the mound (which can be nice if you’re having a heat wave and you get some rain!). I highly recommend installing drip irrigation to your mounds. 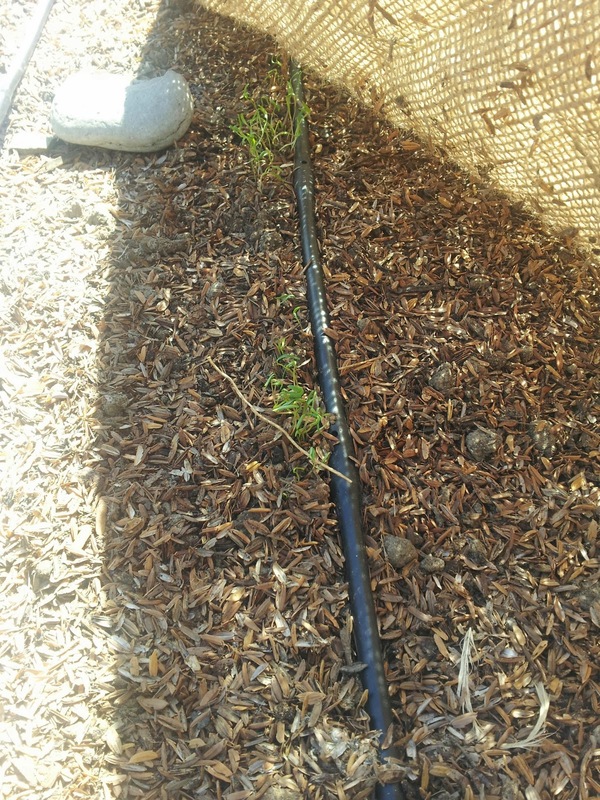 If you plan to do so - create a ring of drip line about the same size as your crater and use landscaping staples to fix the drip irrigation to the top of your mound. We have our drip irrigation set to water the squash for about 30 minutes early each morning, however, until the squash seedlings emerge you’ll likely need to water by hand each morning or evening. 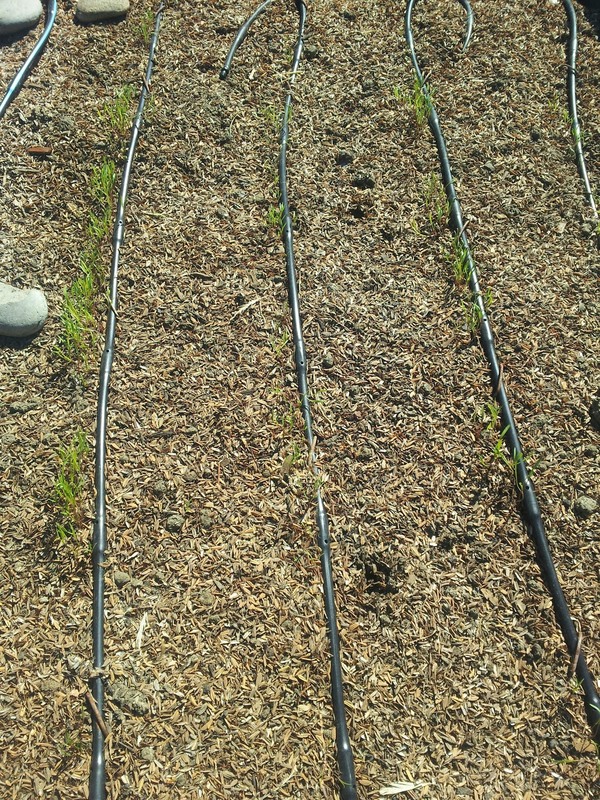 Once the seedlings appear, the drip irrigation will be sufficient. chemical laden wooden posts anymore. To Thin or Not to Thin? 1. It’s more work, especially if you have forty plus plants to deal with. 2. Often times not all five seeds will sprout, so there are fewer to begin with as it is. 3. I love squash and I want as much of it as possible! They say that thinning to the best one or two plants per hill increases the amount of squash each plant will grow, but honestly, I can’t imagine my squash plants being able to produce more than they already do! They seem very happy as they are. However, if the soil weren’t healthy I might reconsider. 4. I like it when the vines go crazy and my garden starts to look like a jungle. Once your squash plants start to take off, keep a close eye on them. Once squash start to appear you’ll want to check your summer squash plants about every other day to make sure a zucchini doesn’t turn into a baseball bat sized squash. Keeping the fruit picked also allows the plant to grow more fruit. Winter squash and summer squash are generally planted at the same time, however, summer squash are ready sooner. Summer squash are squash plants grown with the intent of harvesting the fruit early at the stage where the skin is still thin and tender. Winter squash plants are grown with the intent of harvesting the fruit later in the season when the skin becomes hard. Some varieties of squash are grown both as summer and winter squash. Those varieties can be harvested early and used as you would any summer squash. You can then leave a few squash on the plant to become winter squash. Picking squash can be an unpleasant affair if you aren't prepared. Squash leaves have prickly hairs which can cause skin irritation. Wear long sleeves and gloves when harvesting squash to avoid contact with the leaves. Keeping squash plants pruned by cutting back a few leaves here and there (don't overdo it!) can also make it easier to harvest your squash without touching the leaves. To remove summer squash fruit, use a clean, serrated knife to cut the stem about 1/2"-1" above the top of the squash. I typically store summer squash in the fridge. Winter squash can be more difficult to harvest because the stems grow harder and are sometimes even dry. If a serrated knife can't easily cut through the stems, try using a clean pair of pruning shears. of squash. By the way, it was delicious! If you're new to the concept of crop rotation, be sure to check out my post on crop rotation for an overview. Squash is part of the "fruit" category in our crop rotation. The fruit category also includes vegetables like cucumbers and fruits like melons. Squash should be planted after "leaf" category plants like lettuces and spinach and should then be followed by "root" category plants like radishes and beets. Sometimes leaves on a squash plant may begin to look “dusty” and wilted. This is called “powdery mildew” and you’ll want to keep an eye on it or it can spread to affect every squash plant around it. Remove affected leaves and dispose of them far away from your squash plants. begin to look wilted. And sad. Never hand water squash in the evening once seeds sprout. Water that sits on your plants leaves all night without drying will only encourage powdery mildew to grow. Drip irrigation is a perfect choice for watering squash because it gets the water to the roots and keeps it off of the leaves. It’s also much easier to keep your plants watered when the watering is done automatically - especially if you’re taking care of forty squash plants! Have any questions or tips about growing squash? Wanna tell your “tall tale” about that four foot long zucchini Aunt Ida grew back in the summer of ‘89? Leave a comment below! All content is copyright adventuresoforganigirl.com. Organigirl images by Will Krulee . Simple theme. Powered by Blogger.